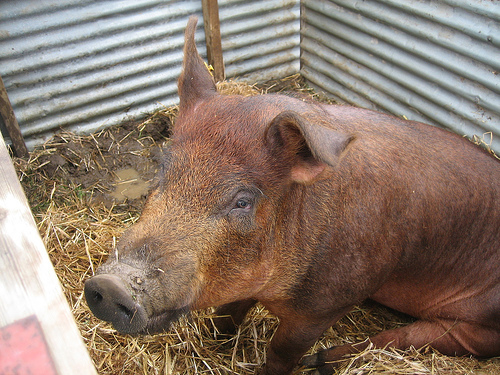 The Tamworth Pig is a large, long-legged pig with a longish ginger coat, long snout and prick ears. It is widely regarded as theclosest breed to the indigenous pig, and that’s because it has not been altered in it’s genetic makeup by the addition of Chinese and Neapolitan blood. A typical Tamworth has the longest snout of the present day domestic breeds. It has prick ears, giving it an alert appearance. 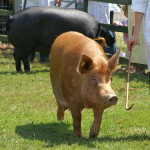 This reflects its inquisitive nature – a characteristic enforcing its reputation for speed within the Show ring. 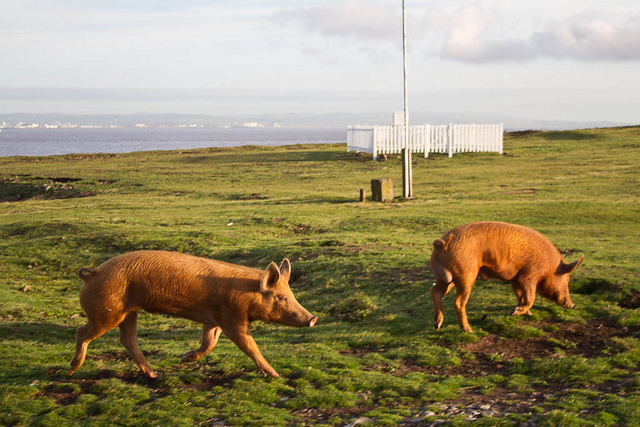 The Tamworth is easily one of the most distinctive and recognisable breeds of British Pig due it’s richly coloured coat that ranges from a paleish ginger like colour to a deep auburn. The Tamworth Pig originated from Staffordshire and is believed to be the closest living relative of the old English forest pig. 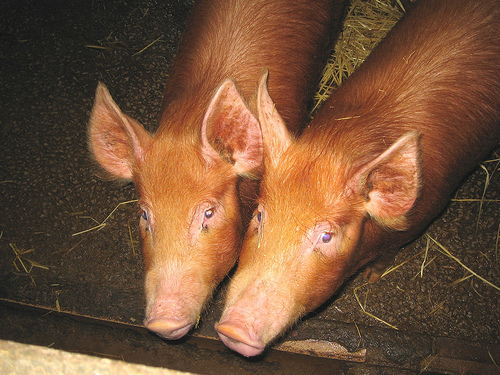 With farmers looking for ways to produce faster growing pigs many of the traditional English breeds were cross bread with imported pigs from Asia but fortunately Tamworths were considered to not requiring “improving”. Consequently their blood has remained relatively untouched for centuries. After World War II, the breeding stock levels fell dramatically and in fact at one point during the 1970’s there were only 17 surviving boars. Breeders has to turn to Australia for imports. In 1976 several boars were imported from the Royal Standard, Golden Ranger and Glen lines. The Tamworth Pig is extremely hardy and capable of withstanding even the harshest of weather conditions. It’s robustness lends itself to outdoor breeding and that’s why it is favoured by farmers and small holders who like their pigs to live a free range life. 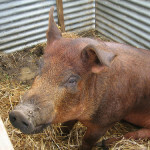 In terms of meat qualities, the Tamworth is one of the few pig breeds that produces succulent pork as well as excellent bacon. 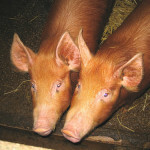 With restaurants increasingly focused on quality more and more chefs have been choosing Tamworth pork for their restaurants and the reputation of the quality of the meat produced continues to grow. 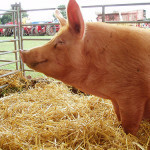 In terms of the qualities of a Tamworth Pig; it’s head should not be too long, the face of the Tamworth should be slightly dished and wide between the ears, with a light jowl. The large ears are finely fringed and slightly inclined. The skin should be flesh coloured and free from coarseness, wrinkles or black spots. The coat carries a distincive golden red colour, abundant, straight, fine and as free of black hairs as possible. The sows are excellent mothers, being milky, docile as well as protective. As with all traditional breeds, the Tamworth is hardy and can be kept in environments ranging from rough pasture to meadowland. Of all the native British breeds it is particularly resistant to sunburn. 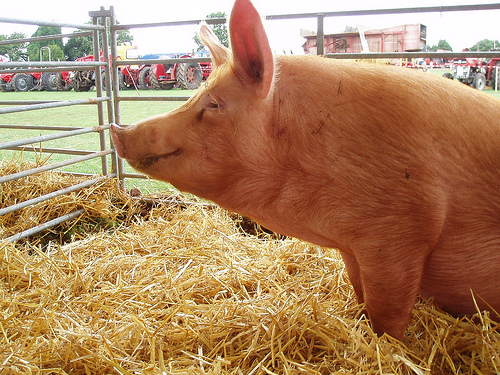 Every Breed of Pig has its own “breed standard” – a check-list of desirable features. All pigs being considered for pedigree registration should be measured against the relevant breed standard, and any being shown will be marked according to the standard, too. olden-red, abundant, straight and fine. As free from black hairs as possible. Not too long, face slightly dished, wide between the ears, jowl light. Rather large with a fine fringe, carried rigid and slightly inclined. Light, medium length, proportionally and evenly set on shoulders. Well-sprung and not too deep. Light, free from coarseness and in alignment with forelegs below and with wide side as seen from in front. Strong and shapely, with good quality bone and set well outside the body. Pasterns short and springy. Pig stands well up on toes. Long and of medium depth. Straight underline with at least 12 sound, evenly-spaced and well-placed teats, starting well forward. Well-developed with plenty of width and giving a firm appearance. Pink and free from coarseness, wrinkles and black spots. If you have any questions about the Tamworth Pig, please contact us.